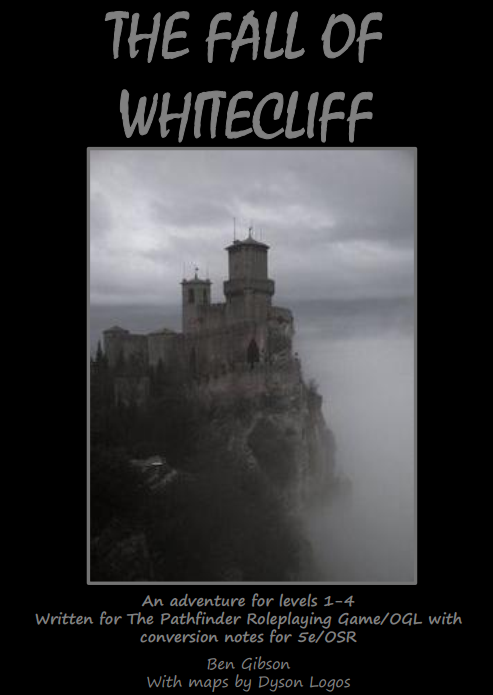 Imprisoned by Charl Rankin, the dastardly Castellan of the coastal fortress of Whitecliff, the characters must first escape from their predicament, and then exact their revenge on their captor while exploring a peninsula thrown into turmoil by repression, rebellious locals, shadowy interest groups, and an ancient secret. There is an entire starting-level mini-campaign in the module’s 22 densely written pages, which is arranged around nine adventure sites presented in the one-page dungeon format, and five supplementary pages that tie together the mini-campaign/sandbox. Starting in a prison cell is a strong premise that gives a mostly non-linear sandbox scenario a useful focus in the form of immediate goals the characters can strive for, and a nemesis they will be all too happy to work against (there is some extra added value in the six pregenerated characters who all have different motivations to go toe-to-toe with the Castellan). This approach walks a fine balance between drive and freedom, although it also means much of the module’s content is closely tied to the Castellan’s machinations, and its adventuring potential is probably going to be fairly exhausted by the time the characters depose him. The module’s strength lies in its sandbox approach. Letting the company work out their own strategy to topple Charl Rankin is accommodated by the way the different locales and factions are set up. Multiple groups on the peninsula have a stake in the Castellan’s fate, but actually getting rid of him for good is harder than you would expect at first: this complication requires the characters to find out more about their enemy and about the Whitecliff lands. The entire module has an interesting aesthetic and approach I wouldn’t classify as fully old-school. Rather, its roots lie in the early 3e era, before 3e adventure design was mostly overtaken by considerations of balance, mechanical experimentation and the heavily linear adventure path philosophy (this is a Pathfinder release, with conversion notes for 5e and old school games). It proves something I have advocated for a long while, namely that 3e can work well in the right hands, and where its excesses are trimmed back a little. There is also some neat flavour in the setting: it is believably frontier-like, and it is a good example of a points of light area. The module’s weaknesses lie in its format and presentation. Much effort was made to fit it into a tight package and place vital information at your fingertips via the one-page dungeon format, but to my eyes, the results show the limitations of this approach. The one-page adventure sites often feel sparse in their encounters – the detail which makes a place feel live and complex is reined in. It is not the author’s imagination or writing skills which are in short supply; rather, it is sticking to the one-page format which are limiting him. Flavour takes room to establish, and while some designers can impart it through a terse text, this doesn’t work in this particular module. The advantages of having all information on a single page are also counterbalanced by the density and (ironically) inaccessibility of the text. Vital information gets lost easily in the densely packed small type. There are virtually no margins and very little white space since the space around the maps is filled with text, frustrating the GM’s own note-taking. Sometimes, the information is so condensed it is hard to follow (this extends to the supplementary pages dealing with campaign-level information). Once again, I am not arguing against brevity, efficiency or innovative ways of presenting game-relevant information, but I find the module’s efforts self-defeating. You will need a highlighter if you want to find useful info in this module, just like you would need it in a traditionally written scenario. While reading through the module, finding information was not any easier than elsewhere. The dreaded two-column layout, while surely antiquated and uncool, has its advantages that help people process information. Margins and white space are not a waste of good paper, they have a purpose (even if I have my doubts about the extra-airy design you can see elsewhere). I feel like this is just too much. What would happen if the one-pagers were two-pagers instead? Would it really be the end of the world? There are some rather neat additions at the end of the module where it is all fine: a list of twenty random encounters at one line each, and a table of fifty imaginative treasures which are assigned to the module’s random hoards. These are places where the supplement’s brevity works quite well, combining accessibility and efficiency with flavour. Elsewhere, being less dogmatic about the format would have been to the module’s advantage. Indeed, I would very much like to see more from Ben Gibson. But I would very much like him to let his material breathe a little. No playtesters were credited in the adventure. Appreciate the review, Melan. The feedback I've gotten lately has been positive but the main critique has been the density in places, I actually do think I'd make the next in a two page form for the dungeons/adventures. My preference when I'm writing for myself is to make a single sheet; indeed long before this was a product it was nine single pages that we played over eleven sessions. I am interested in products that divy up nicely into atomized sessions, because I can't do a weekly/biweekly regular game. I don't think I'm alone in that need. It's more than that, though. Maybe it's like training wheels but I like to keep a strict format for my own benefit. Having these tight boundaries that I need to strain against helps prevent a lot of the massive excesses that I know I am prone to as any writer will be. I think it was Samuel Johnson who said, "I don't have time to write you a short letter, so here's a long one." Your street against Ultra minimalism is very well taken. Clearly the format has been fetishized as an ideal and I don't actually think that it is the best way of conveying information in many cases. But it might be the best way to convey information for me, and it's the best way I consume information. Thanks again for the review. I hope you get some good use out of the adventure, I definitely do plan on publishing again. Thanks for dropping by, Commodore Sven! I appreciate your comments. Fully agree that self-imposed rigorousness is important, and understand the importance of boundaries in encouraging creativity. My point - and it seems we agree on that - is that the one-page format can outlive its usefulness when we try to use it for ideas that can't be expressed in its limited space. 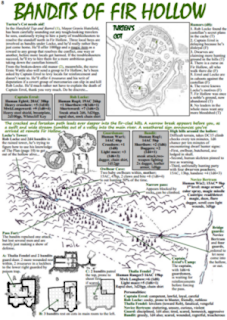 My ideal mini-scenarios would be about 2-3 pages long each, including an annotated map. You can still lay that on the table as a two-sheet spread (or print it on a larger sheet and fold it up). I am looking forward to what you release next. I mainly read adventures for inspiration and to learn new things, and I did learn from this one - but beyond that, this was one of the few ones which made me consider actually running it. Its focus and self-contained nature have definite benefits, and it also reminds me of our 3.0-era adventures (although ours tended to be more chaotic). If I run that game again, this will be the scenario of my choice. Hey, so I've released another adventure, incorporating a lot of the lessons learned from the format of Whitecliff. If you're interested, I can send you a review copy. All playtesters are given their due this time, too, I really appreciated that critique.